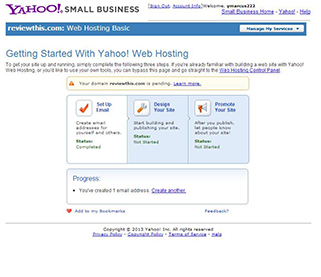 If you're in the market for a web hosting provider, you may be surprised to learn that Yahoo! isn't just a search engine, but a hosting provider to thousands of websites. Yahoo! 's web hosting services were originally founded as Geocities, a service now available only in Japan, but its global web hosting service has morphed into a service specifically for small business owners, which is now part of Yahoo! Small Business. 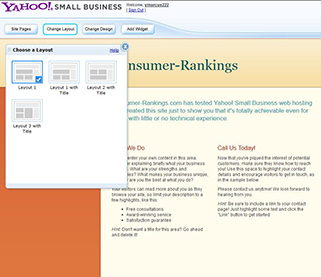 If you're a small business owner looking to launch your online trade, read on to learn if Yahoo! Small Business web hosting is right for you and your growing company. Yahoo! offers three web hosting plans, each of which can be purchased for a low monthly fee and an even-lower introductory fee (for the first three months). The plans are called Basic, Advanced and Premier, and although Yahoo! offers many similar features between these plans, they differ primarily in the amount of storage and transfer available for each. Yahoo! Small Business web hosting also offers premium services for nominal fees, such as the use of DudaMobile, which helps adapt a site for more convenient mobile access. Yahoo! Small Business hosting packages can be cancelled anytime within the first 30 days for a full refund, minus your $7 domain registration fee. After the first 30 days, customers with yearly plans can cancel for any reason for a pro-rated refund, minus any domain registry fees. Yahoo! Small Business web hosting offers advanced marketing tutorials that will be especially helpful for people new to the world of internet business. These tutorials cover such topics as submitting your site to search engines and sending grand opening emails to relevant recipients. Yahoo! also offers instructions about how to optimize websites for search engine visibility, how to improve conversion rates and how to increase awareness, all topics that are not generally covered by other web hosts to such an extensive degree. Unlike other top web hosting providers utilizing familiar control panels, Yahoo! web hosting uses its own proprietary website builder, designed to be easy to use for entrepreneurs, who have little to no technical skill. There's no question that Yahoo! delivers on its goal, and the drag and drop site builder is certainly one of the most intuitive site builders out there. 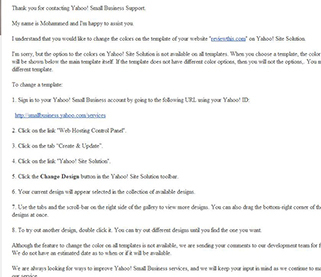 It is worth noting that the website builder offered by Yahoo! Small Business hosting offers step-by-step prompts throughout the site building process to help ensure that first-time site builders will not forget a critical step of the site building process. Creating an email address was a snap, even easier than building the site. All I had to do was insert the username and press finish, and Yahoo! successfully created the new account. Yahoo! didn't even slow me down by asking me to create a password for the new email account, instead providing one that had all the required security features. Webmasters can use the extremely popular Firefox and Internet Explorer browsers to build their websites, though Yahoo! Small Business web hosting is not yet compatible with Google Chrome. Yahoo! Small Business hosting offers phone support for sales from 7am-5pm PST, as well as technical support by phone 24/7. During the course of this Yahoo! web hosting review, I called the customer support hotline several times. Yahoo! offers a recording informing webmasters of how long their hold time is anticipated to be, so that you may try again later, if you wish. My call to the sales center was answered within one minute, and each representative was quite knowledgeable about the issues at hand. In fact, the sales representative I spoke with was even able to answer some of my technical questions, which was quite helpful. A notable advantage of Yahoo! 's customer support is that the company offers a call back service, which allows you to request a call back and tells you how long it should take to receive the call. I tried to send an email to Yahoo! at 2:48pm EST on a Tuesday, and received an automatic response that informed me that emails are generally answered within 24 hours. The response came about 22 hours later, and addressed the question quite directly. Finally, Yahoo! offers a thorough list of articles that answer many common questions related to web hosting and web building. The company also tries to offer relevant article suggestions based upon your activity on the site, which may be helpful for some Yahoo! users.